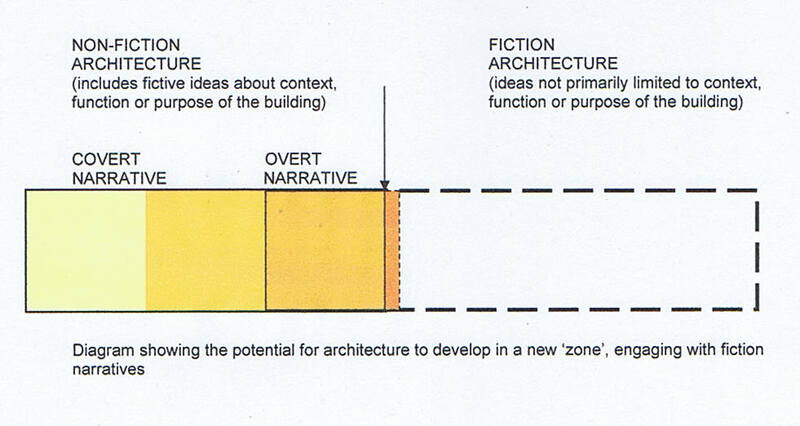 In this diagram the current architectural paradigm is represented on the left, and may be described as creative non-fiction, which is documentary in nature and didactic in tone. Where overt narratives are introduced they usually express ideas which are subservient to context, function or purpose, and are justified in this way. On the right hand side the possibilities of architecture are extended by the acceptance of the premise of fiction, which underpins the novel in literature. Briefly, this is the notion that the intellectual content of a work may be based on make-believe and pretence. For further elaboration, read through the posts on this blog from July 2009.